The BCW Butterfly Jewelry labels are a supreme quality polypropylene material available in direct thermal and thermal transfer formats for use with all desktop printers that use a 1" core label. 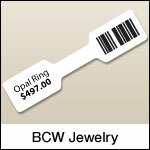 All BCW Jewelry labels provide resistance to oils, blood, alcohol, water and common industrial cleaning solutions. The BCW Jewelry label is specially treated with UV shield to provide excellent resistance to ultra violet light. 2.25" x 0.50" direct thermal, polypropylene jewelry label on a 1" x 4" core. Our butterfly jewelry labels feature an Adhesive Free Shank! 2500 labels per roll / 1 roll per case. BCW 1191125 special features - Black Mark Sensing, Perforated. No ribbon required. NEW! 2.25" x 0.50" direct thermal, colored polypropylene jewelry label on a 1" x 4" core. Available in 13 colors, our butterfly jewelry labels feature an Adhesive Free Shank! 2500 labels per roll. BCW 1191130 special features - Black Mark Sensing, Perforated. No ribbon required. 2.25" x 0.50" thermal transfer, gloss polypropylene jewelry label on a 1" x 4" core. Our butterfly jewelry labels have 2500 labels per roll / 4 rolls per case. BCW 2191125 special features - Black Mark Sensing, Perforated. Use with BCW Wax Resin ribbon.